When reading about the history of our country and in particular, the Native Americans many people have heard of a ceremonial tradition that is known as the Native American rain dance. The Native American rain dance was the most common among the Native American tribes in the southwest of America, since during the summers there they would have long droughts. The droughts could bring serious problems for the natives since having some rain was essential for their survival and their food crops. The rain dance would usually take place in the driest month of the year, so usually this ritual was performed in mid to late August ever year. The Native American rain dance was performed by both the men and women of the tribe, unlike other tribal rituals where only men were allowed. 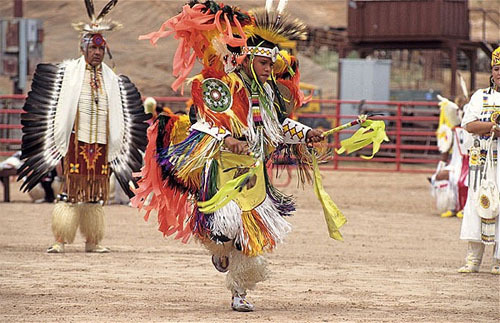 The Native Americans wore special costumes when performing the Native American rain dance ceremony, and these costumes were used just for this specific ceremony every year. The men would have long hair waving in the ceremony and the women wore their hair in a special tribal wrap at the sides of their heads. The mask that the Indian men wear is a mask with a turquoise strip that stretches from ear to ear across the face of the mask. Then the bottom is a band of blue, yellow, and red rectangles. A fringe of horsehair hangs from the bottom which covers the throat and three white feathers hang from the top of the male mask. The women’s mask is somewhat similar but instead of a turquoise stripe theirs is white and they do not have the rectangles on the bottom or the horsehair. The women’s masks also have goat hair around the top and an Eagles feather hangs over their face. The men also have their bodies painted up by tribal standards and wear special beads and they wore a fox skin hung behind them and also a silver bracelet and white apron type cloth. They also wore turquoise moccasins. The women wore a black dress and no parts of their bodies were shown except their bare feet. Then they wore a bright colored shawl with one black and one white shawl over that. Then they all lined up and performed the Native American rain dance in hopes of bringing the rain that they desperately need. 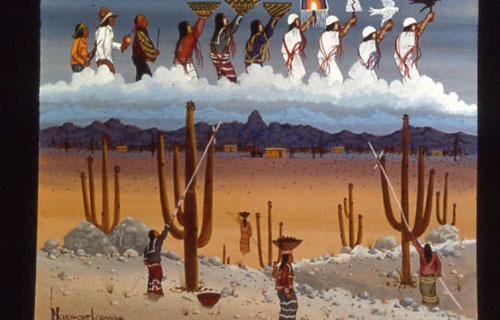 Many reservations in the southwest still perform this ritual to this day.